Happy Earth Day everyone! Today is the day we all celebrate and participate in making improvements to the environment any way we can. 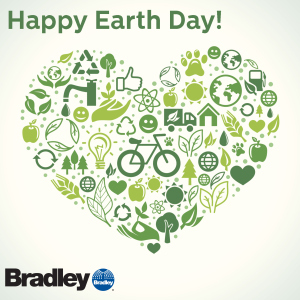 The first Earth Day dates back to 1970. Sen. Gaylord Nelson (D-Wis.), was the first passionate advocate for protecting the environment and responsible for increasing awareness of environmental issues and creating what we all know today as Earth Day. Many companies are doing their part by encouraging employees to use less paper and take public transportation to and from work, allowing some employees to telecommute, and using green materials and alternative heating systems when they rebuild or renovate. Here at Bradley, we have incorporated a program for the week to recycle all old electronics employees may not use anymore. 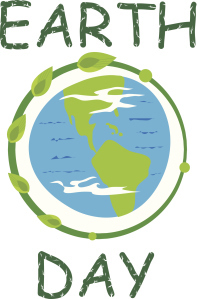 Also, we are encouraging employees to save on paper by reducing our printing numbers by 10% during Earth week and plan to continue this program throughout the year. In the meantime, think of how you can stay green and help the environment consistently.